In earlier decades of my life, some of my most ebullient memories were made in DANCING. I lo-o-o-oved to dance. I did American country dancing, English country dancing, international folk dancing, ballroom dancing, clogging, and swing....anything with a partner. I'd get so "high" on ebullience, that I'd never know my feet hurt, my stockings were torn, even that there was blood in my shoe! I'd be swept away on the music and would go till the musicians pooped out! 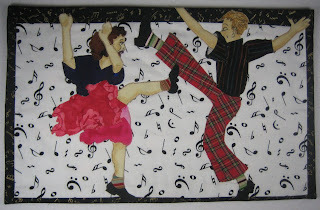 So dancing was the inspiration for this little quilt. As luck would have it, I came upon an old photo of a couple of swing-dancers, which helped me figure out where to put the arms and legs. I made each of the dancers as a separate "doll" and had such fun dressing them as urban swingers of my generation. Of course they had to have mismatched patterns, cool sox, and leather-soled black dancing shoes. I had just a small piece of white music fabric for their background, and then found some black "music" fabric for a border. The biggest problem I've been having in these challenges is staying within the 11 x 17 dimensions. My ebullient dancers were really struggling to burst out! I've had such fun with this challenge, remembering the JOY that came with DANCIN'. Sue, absolutely wonderful. Love the facial expression on the woman. The fabric for the clothing is perfect, brings back memories of dance shows on TV. Your dancers are so full of life....perfect representation of the word. Makes me want to get up and dance with them. This is so perfect for your 'ebullient' interpretation. The idea of making each as a doll and drssing them, you must have had a lot of fun doing this whole piece. It is great! Any plans for it?